Product #60508 | SKU MH494 | 0.0 (no ratings yet) Thanks for your rating! This Manfrotto 494 Center Ball Head features an integrated RC2 quick release cam lock and a 200PL-PRO Quick Release Plate. 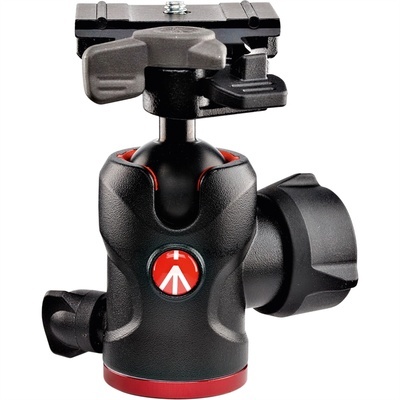 The Manfrotto 494 Center Ball Head with 200PL-PRO Quick Release Plate features an integrated RC2 quick release cam lock and a 200PL-PRO Quick Release Plate. Compatible quick release plates can be removed from the head by pulling the cam lock's spring-loaded lever, which also allows the plate to be instantly reattached. The cam lock also features a safety catch to prevent a compatible quick release plate from accidentally disconnecting. The 494 Centre Ball Head with 200PL-PRO Quick Release Plate has a load capacity of 7.98kg and can be attached to tripods or other support systems that feature a 3/8"-16 mount. By loosening the head's primary locking knob, the ball-and-socket joint can be quickly swivelled, angled, fully tilted, or returned to its upright position. A recessed dial set within that locking knob can be rotated to apply tension control to the ball-and-socket joint's movements. Along the opposite side of the ball head, a secondary locking knob controls the ability to rotate the head 360°.